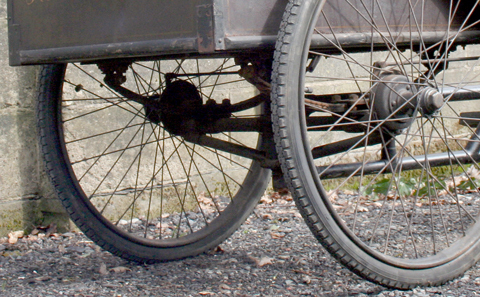 The industrial tricycle was developed in England in the 1870s. 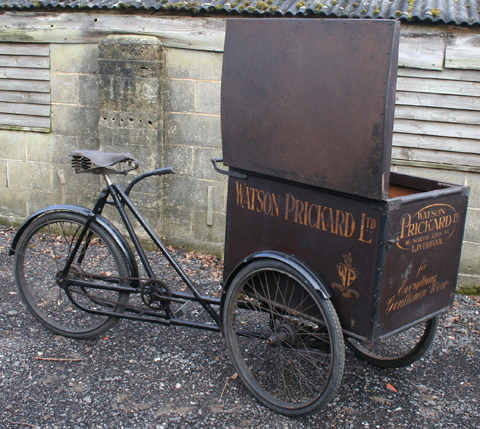 It was commonly used by grocers, bakers, druggists and other tradesmen. 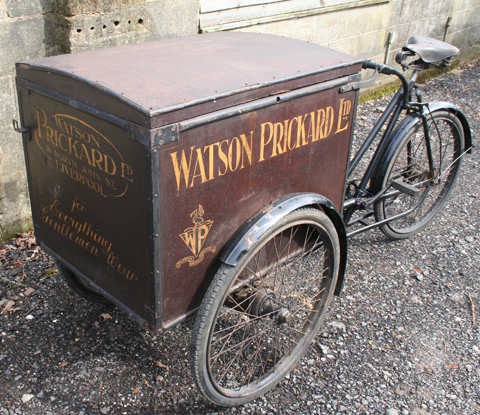 By 1939, in London, there were 4,000 ice cream tricycles. 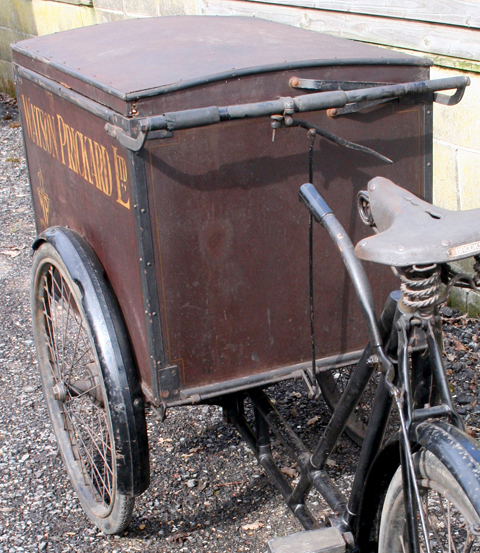 Delivery tricycles are still used all over the world, but especially in Asia where they can carry loads of up to 1,000 pounds. 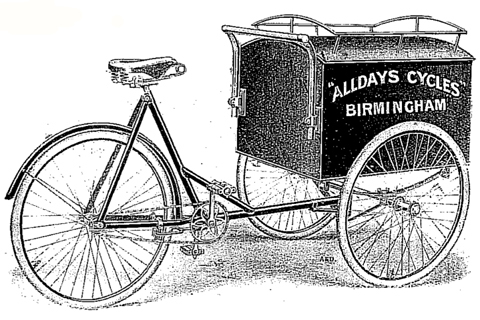 Companies such as Alldays & Onions made a standard carrier tricycle, but would also adapt the delivery box according to a customers needs. 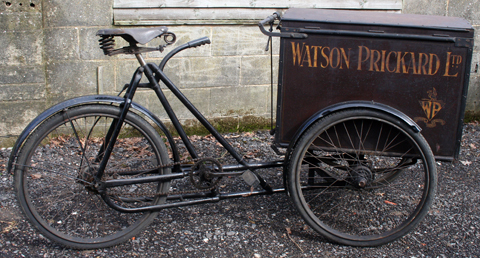 This 1905 Alldays Delivery Tricycle was used by a firm of Gent’s Outfitters Watson Prickard Ltd of 16 North John St, Liverpool. 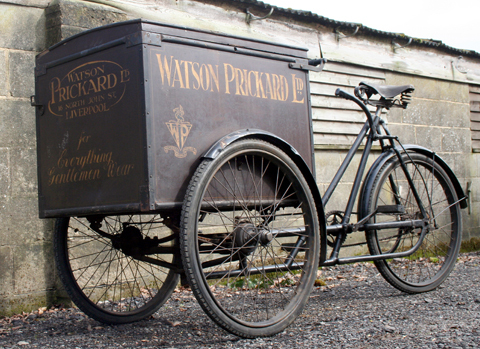 Though the company moved premises, the Watson Prickard Building still exists at this address. 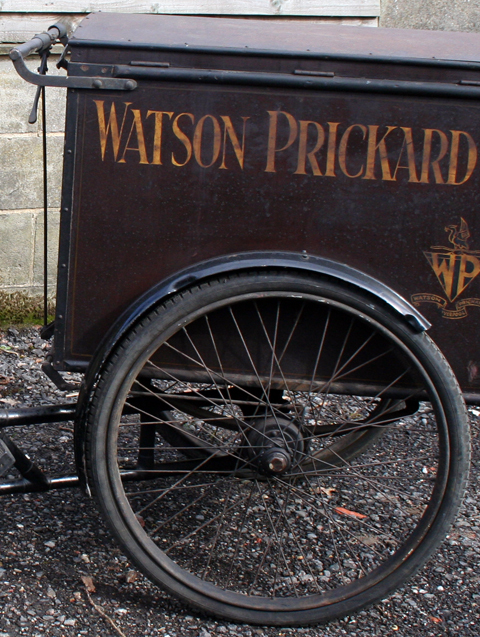 I found some old laundry boxes in the Alldays, so I assume that one of its duties involved delivering and collecting dry cleaning. After World War II, with changing market requirements, Alldays & Onions Ltd establish itself as a market leader in the manufacture of centrifugal fans expanding into the field of dust collecting and chemical engineering. 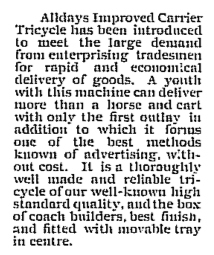 In 1969 the company merged with rival fan company J.C.Peacock forming Alldays Peacock & Co Ltd and in the 1980s the company expanded its factory in Weston-Super-Mare in Somerset and began selling abroad. 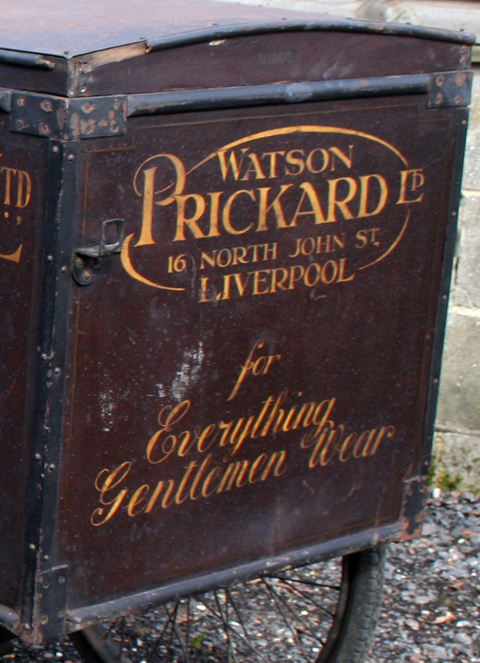 In 2005 Alldays Peacock was purchased by the world’s leading fan-maker, the German-based Witt Group and became part of Witt UK; manufacturing moved to Halifax, West Yorkshire. 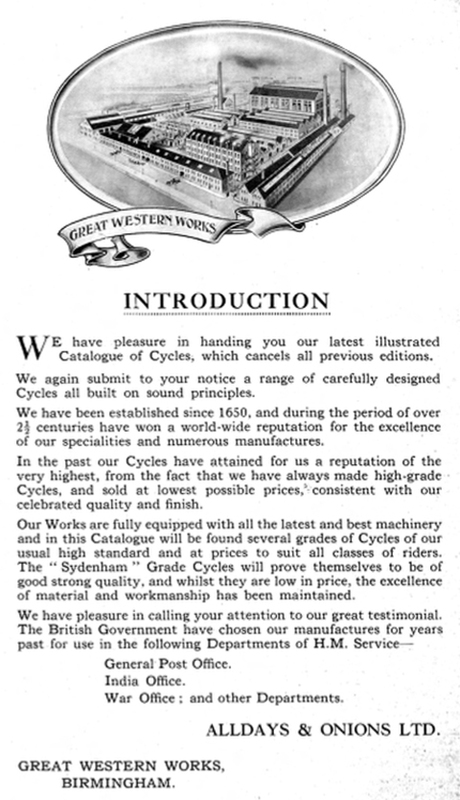 Though they no longer make bicycles, it’s refreshing to see that this manufacturing company has survived, with various mergers and changes, for around 360 years. 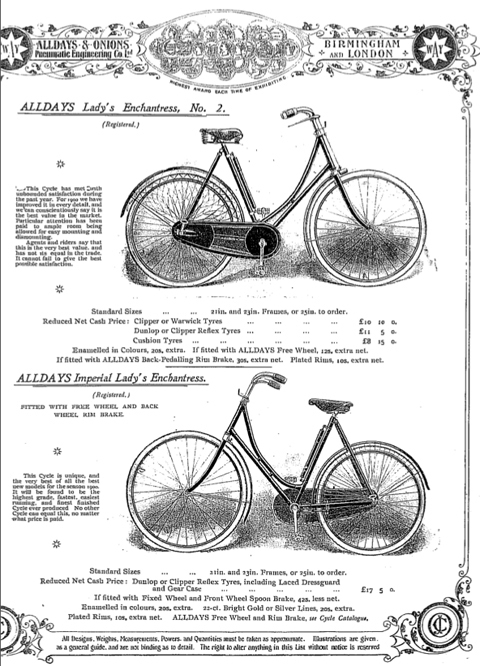 These pictures are from the 1900 Alldays catalogue, where you can see the earlier design of the carrier tricycle. 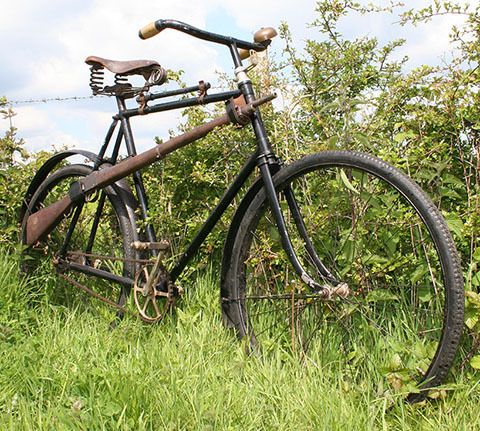 I’m not sure when the design was changed to the later style. 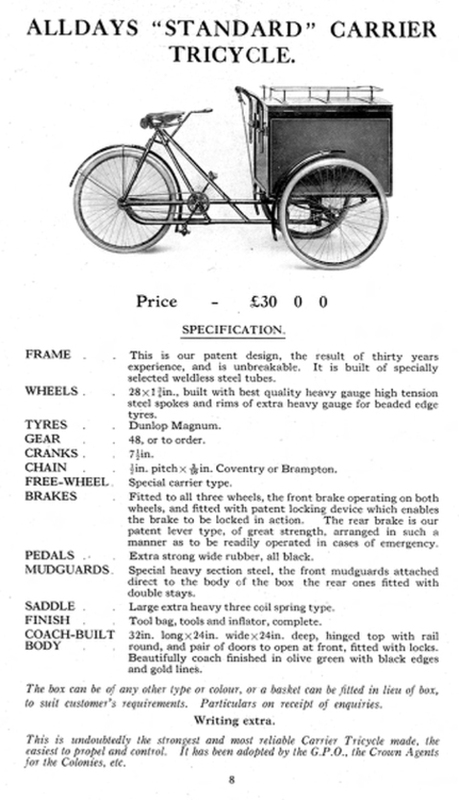 Since the introduction of this cycle to our catalogue, it has met with an unprecedented success, we having received large orders from several regiments, volunteer corps, etc including the British South Africa Co, for use in the Transvaal; and the British Government selected it in competition for the War Office Department, and gave us large contracts during 1898, 1899, 1900, 1901, 1903, 1904 and 1905. 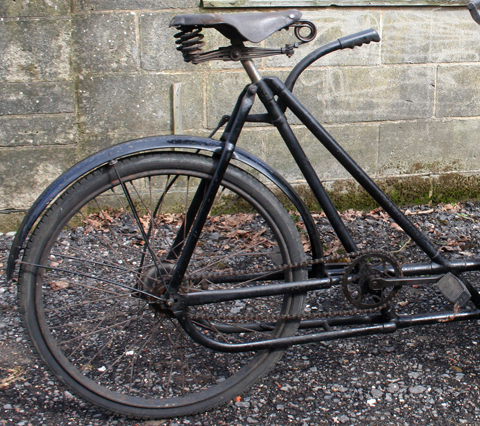 We have also supplied it to the P.O. Department and the Admiralty, and umerous Colonial and Foreign Governments. Having been amongst the first to notice the value of the cycle as an adjunct to military equipment, we have for several years given special attention to this branch of the trade, with the result that we can now supply machines for military and similar purposes that do give every satisfaction. 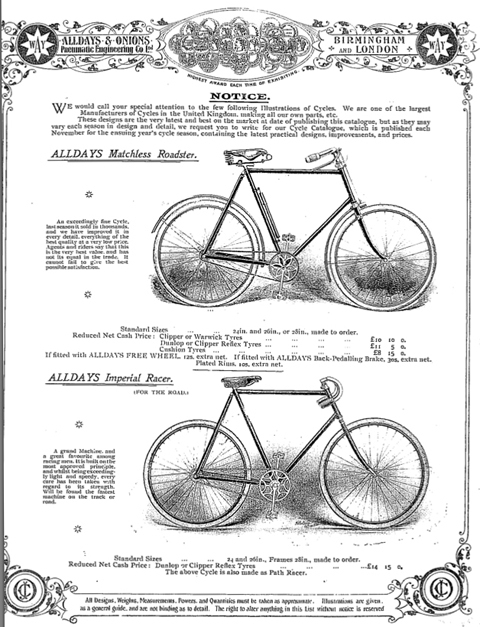 We have, during the last few years, had the honour of supplying machines for Military, Postal, Telegraph, and other Government Departments, as well as to several of the cycle corps connected with various regiments both at home and abroad, including the British South Africa Company, Admiralty and War Office, in July 1898, 1899 and 1901. 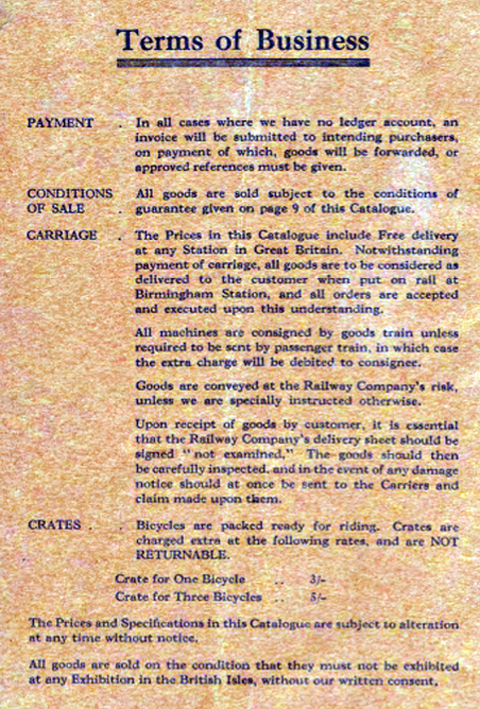 Further contracts for cycles have also been received from the War Office viz January 8th and 24th, and February 28th, 1901, for 800 cycles; another large order in July 1904, and again in July 1905, and several subsequent contracts over 1906 and 1907. 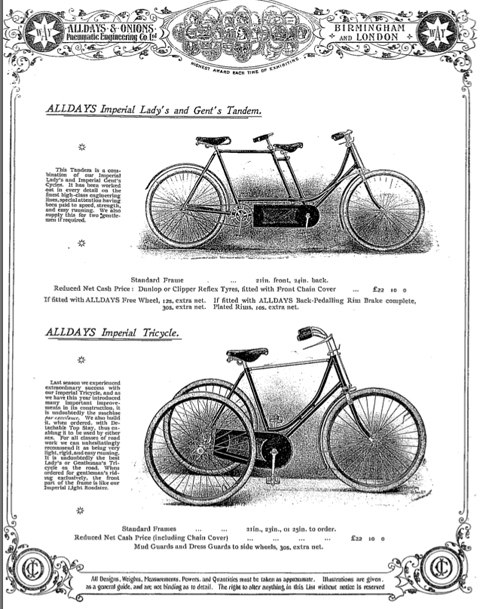 The machine illustrated will be found to be admirably adapted for the above requirements, being specially strong, and constructed to stand the wear and tear which such cycles necessarily have to undergo. 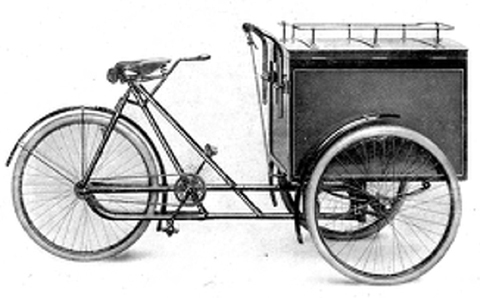 It is similar in finish, etc to our well-known Imperial Roadster, given on page 13. 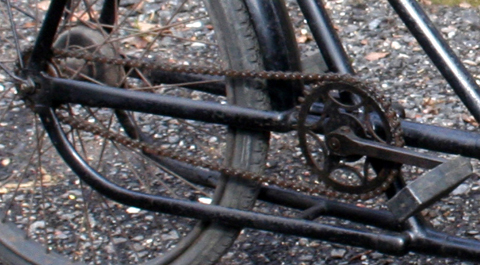 The machines, can be fitted with Rifle Clips, Sword Clips, and other accessories to order, as may be required. 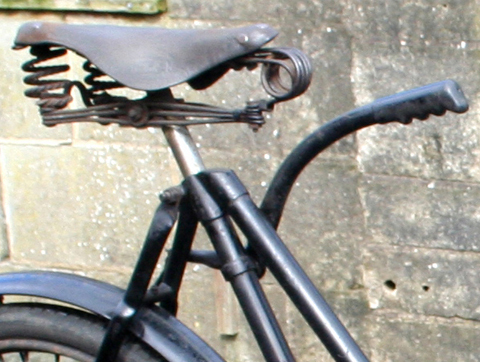 The position of the gun in the photograph is, in our opinion, the most conventient, but the clips can be fitted to any desired position. 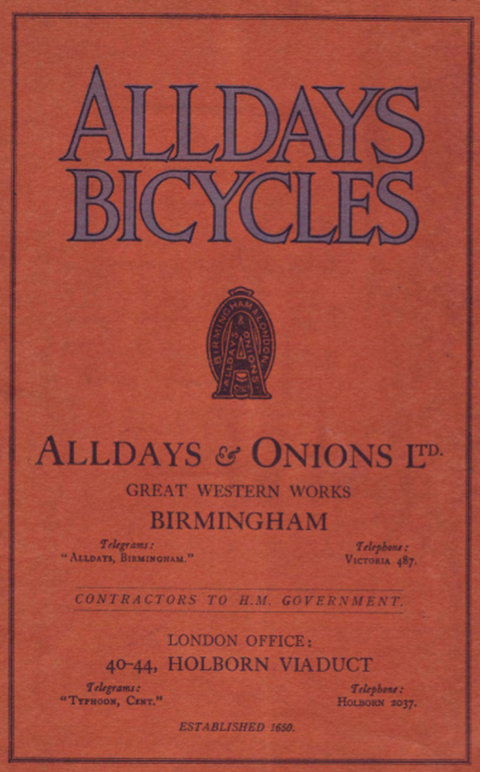 UPDATE 12th March 2009: When I saw the above badge advertised for sale on ebay, I did an internet search for Onions Equipment and came up with the brochure below, which appears to show that either Onions had merged at some time with Vickers, or that Vickers manufactured and/or marketed equipment for which Onions had the patent.